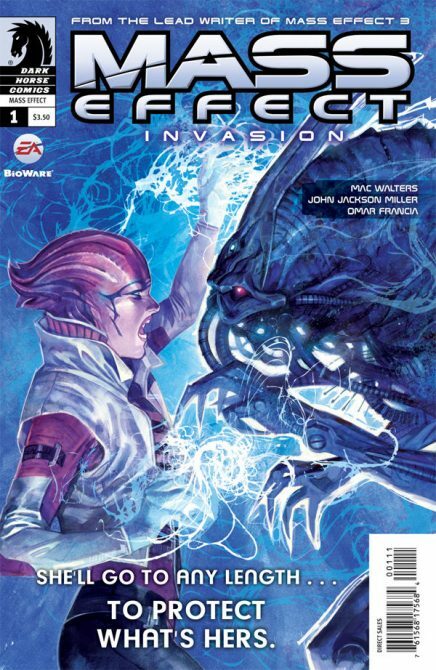 So far, the Mass Effect: Invasion series from Dark Horse has been a pretty good way to tide me over until the release of Mass Effect 3 in March. We’ve gotten some interesting moments with Aria, and a new Cerberus general who not only has a refreshing grasp of history, but a flexible moral code similar to Shepard. That said, General Petrovsky is still a more loyal soldier to Cerberus than Shepard was. Petrovsky’s loyalty is the center of the conflict in the third issue of the comic, and even though he is a nice character, his conflicts seem genuine. He struggles with his own sense of honor as it conflicts with the Cerberus plan for Omega. Part of what is so exciting about this issue is seeing how Cerberus, which seems to often underestimate other races, continues to underestimate Aria’s precocious balance of power, as well as everyone else’s greed on the station. The conflicts going on on Omega between the various mercenary groups are interesting to see, especially as they feel like nice throwbacks to the earlier parts of Mass Effect 2. 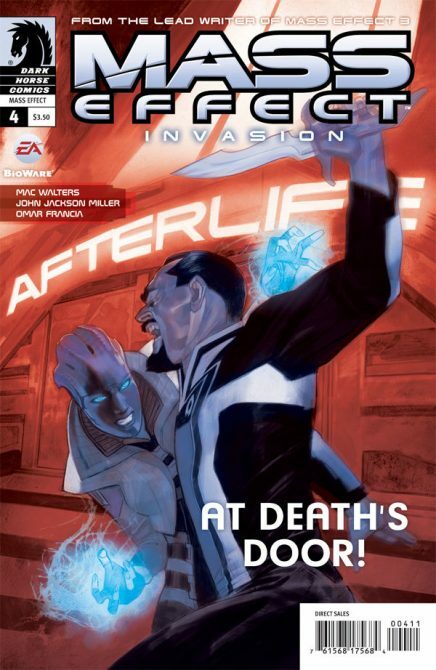 Anto, Aria’s second-in-command and one of the few likable Batarian’s in the Mass Effect universe gets some amusing pages in the comic, but Aria and Petrovsky are still the real stars of the show, and now, Aria is pissed. Petrovsky’s motivations and actions again seem to conflict, as he will spar with Aria on one page, and then save her on the next. It seems like he is playing the double agent though he claims to be following the Illusive Man’s orders, but at the same time, he also seems to have his own plans. His desired endgame is what is so unclear here. So Aria and General Petrovsky are still good and interesting characters, Aria gets a few great verbal hits in at both the Illusive Man (who is not actually seen this issue, save on the awesome variant cover above) and the General, and the art shines as firefights erupt around Omega. However, my personal highlight for the issue wasn’t the excellent characters or the firefights. It was the single image of an Elcor ruining some unlucky Human’s day. 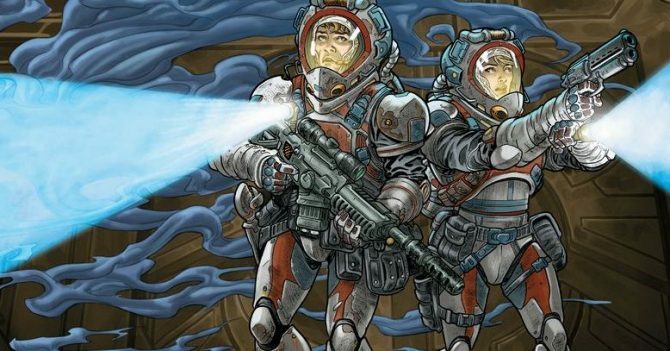 Overall, the third issue, while not the best in the series, is still a very enjoyable bridge from the rising action of the second issue to the conclusion that should occur in the fourth and final issue. If you’ve already gotten the other two, this issue serves to strengthen the characters and there is no reason not to pick it up. 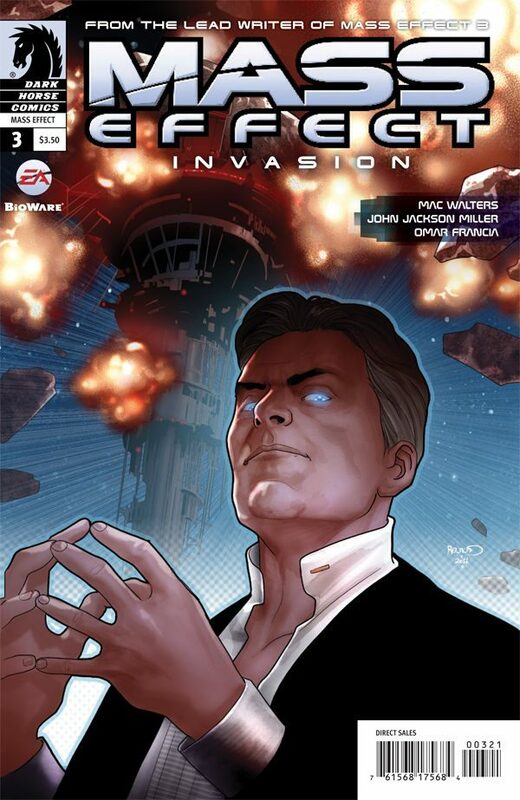 I genuinely can not wait to see what is in store for the conclusion of the Invasion series next month.